She's reinvented herself with a television career mentoring young models. And now Naomi Campbell is showing them how it's done. 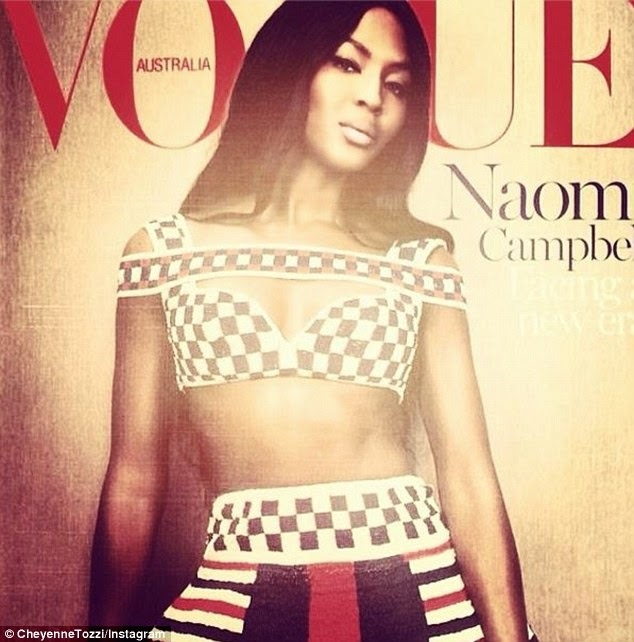 Garnering her very own special edition cover of Vogue Australia, Naomi, 43, channels a modern gladiator look in a checker-board bralette with an attached tribal patterned band wrapped from shoulder to shoulder. Her age defying toned physique is on full display in matching a-line skirt on the polarising cover. The original supermodel's trademark long tresses fall in a centre part and given a slight waves that drape her collar-bones and back. However, the fabulous cover gives only a taste of what readers find on the inside of Vogue's May edition. In the luxurious retro-chic spread, the formidable icon models looks by Givenchy, Lavin, Prada, Stella McCartney and Miu Miu. Naomi dazzles in eye popping jewel tones, bold bead and sequin detailing and lavish patterned fabrics, for the Christine Centenera styled shoot. The feisty Brit has reinvented herself in Australia thanks to modeling show, and while she is close to Cheyenne, her other competitor, Australian model Nicole Trunfio, hasn't made Naomi's clique. She gave the stunning New York-based 28-year-old a serious dose of her diva antics on The Face.